Waterloo Container is a family owned business founded in 1980 by current President, Bill Lutz. Located in the heart of the Finger Lakes wine country, we are a complete packaging supplier, offering an unmatched variety of glass bottles for wine, liquor and spirits, and beer. Complete your package with our selection of corks, capsules and closures. 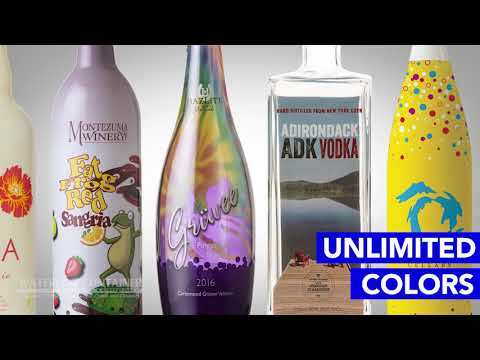 We now proudly offer state-of-the-art Custom UV 8 color bottle printing and automated shrink sleeve application. Repack is also available. We can completely customize your bottle, cap and box to enhance your shelf presence and make you stand out! We are proud to have been an integral part of the wine and craft beverage industry’s growth in all of Eastern North America. We are all dedicated to collaboration with our customers and committed to providing the highest quality glass and packaging products available. We look forward to continuing to grow together over the years to come. Check out our new website at www.Waterloocontainer.com today! Call 1-888-539-3922 to place an order with one of our friendly customer service representatives! With your artwork and our 8 color custom glass printing technology, the design possibilities are virtually endless. Replace your paper labels with stunning UV cured ink graphics and stand out on the shelf! Add a bold logo or a whole canvas of eye-catching color to your corrugated package. Our packaging experts can help you make the move from blah to bold. Custom Closures- stand out from the pack! Decotated closures give your product a polished look that customers will notice! Let us help you top off your product with style! We have high speed sleeve applicator and stream tunnel to shrink your sleeve onto our glass. Create a shelf worthy presentation with this all-around labeling. Repack - Ever wonder who puts the bottles in the boxes? Our re-pack service takes bulk glass and moves it into content, kraft or custom boxes for you. This service can save you money and give you access to unique european ware. Our quality department will work directly with you to address and resolve any quality issue that may arise. We are dedicated to giving you the best quality products and guaranteed service you deserve. Have more inventory than space to store it? No problem! You can take advantage of our large warehouse capacity to temporarily store your ware. With forecasting and advanced purchase, we can help you manage your stock. Freight - load em up and ship em out! Our fleet of vehicles and our expert drivers are equipped to provide you fast, courteous and dependable service. Take your label to the next level with Shrink sleeve application at Waterloo Container. Waterloo Container offers 8 color Custom Glass Printing! Make your bottle stand out with 360 degree design. Get a better customer experience with Waterloo Container. Trust us for reliable glass supply, extensive product knowledge, and industry expertise. Our huge inventory of ready-to-ship, quality glass bottles and premium closures ensures you will have what you need when you need it. See Waterloo Container at CBC in Denver! See us at the upcoming Craft Brewer's Conference in Denver, Colorado! Visit booth #4103 to see what we can do to customize your bottles with shrink sleeves or direct glass printing! Check out our website at https://waterloocontainer.com to see all of our packaging options and services! Timing is everything, they say. It certainly was for Bill Lutz, president and owner of Waterloo Container. The company he created with his father, Norm began by circumstance. They were in the warehousing business when one of their clients, a California wine bottle company, closed. The father-son team bought the inventory and started selling it to existing winery customers in the Northeast. In 1980, when Waterloo Container was founded, New York’s wine industry was starting to take off. The passage of the New York Farm Winery Act in 1976—allowing small wineries to sell their wines directly to consumers, and not just to wholesalers—kindled explosive growth in the industry. That year, there were 19 wineries in the state; 12 of those were in the Finger Lakes. Today, the Finger Lakes is the largest wine-producing region in the state, with over 130 wineries. As the industry has grown, Waterloo Container has too. It is now the largest stocking distributor of wine bottles in Eastern North America. Waterloo Container’s customer base has grown from 50 to 5,000. It also supplies bottles and closures to craft brewers and distillers, in addition to wineries. Locally, customers include well-known names such as Glenora Wine Cellars, Bully Hill Vineyards and Swedish Hill Winery. As a family-owned company employing 53 people, Waterloo Container is known for its personal service. While many customers buy truckloads of bottles, the company is also able to sell as few as one case, said CEO Rich Swinehart. In addition to stocking domestic and imported glass bottles, Waterloo Container can also create a custom mold of a bottle and send it to be manufactured. It is one of the few companies in the industry to work with American manufacturers to purchase and make its products. As the variety of wines has grown, so too has the range of bottles and packaging. At one time, Lutz explained, customers could choose among 10 different bottles. Today, there are upward of 500 options, in different shapes and colors. New introductions over the last several years have included synthetic corks, screw cap bottles and packaging such as printed bottles (with the label printed directly on the glass). As a result, Waterloo Container is producing a lot more items to meet consumer demand. Swinehart, a former Seneca County District Attorney, joined Waterloo Container in 2013 after doing legal work for the company as a private attorney. Bill’s wife, Annette is co-owner and part of the executive management team. They have three daughters whom they hope will join the company after college. Many of Waterloo Container’s customers are family-owned businesses, too. The company has built a reputation as a trusted partner in their growth. For example, start-up producers often can’t take on certain expenses, such as having a forklift and loading dock to take delivery of supplies. So Bill and Norm helped develop a special closed trailer that could hold a moffett, or three-wheeled forklift, on the back to offload glass bottles from the truck to the customer. Being located in the Finger Lakes puts the company close to major metropolitan markets and gives it a competitive advantage. The company is planning to hire up to 20 new employees as it completes a 37,000-square-foot addition to its facility on State Route 414 in Waterloo. The expansion includes more warehousing space and the purchase of new packing machinery to improve the speed and efficiency of operations. “In recent years, the company has grown more than I ever thought it could, and we’re looking to do even better in the coming years,” said Swinehart. Lutz credits employees for the company’s impressive growth. Waterloo Container has succeeded by staying true to its roots as a family business grounded in personal service, honesty and integrity. Last year, the Finger Lakes was named America’s top wine region in a nationwide poll conducted by USA Today. You've already told us you love our 5540X pressure rated 750ml bottle. Now love it even more in a striking Champagne Green color perfect for your next fizzy concoction! Waterloo Container proudly offers this unique pressure rated bottle starting February 15! See Us at One of This Year's Tradeshows! Waterloo Container participates in many regional and national industry tradeshows! We attend these events to learn about the latest trends and offerings in the industry. This helps us learn what new items you will be looking for in the coming year. We also exhibit at many meetings and shows. Having a booth at a tradeshow gives us an opportunity to show off our product and services. We also enjoy meeting our current and future clients and catching up with you in our booth! First up is Ohio Grape and Wine! Stop by and talk to George and Joe at the Sit Sip and Learn preview day on February 17! Be our guest: Ask us about EWE show passes or free entry code! Waterloo Container offers state of the art UV glass printing technology paired with the best bottle and closure brands on the market. Our packaging team with work with you to deliver eye catching results with total customization. Waterloo Container takes pride in partnering with only the best in the closures industry. We are happy to announce we are now offering co-injected 19.5mm synthetic bartop closures by Supercap. Supercap is a global closure manufacturer with an impressive brand portfolio. They have been innovating the closure business since 1999. Supercap is also BRC (Global Standard for Packaging & Packaging Materials) certified. We want you to try these Supercap samples in your own facility, as we want our customers to feel confident that this new product satisfies your quality and fit requirements. Please call our Customer Service team at 315-539-3922 to get a free sample bag today! SENECA FALLS — Waterloo Container is physically getting larger. And when a current expansion is finished by the end of the year, its workforce also is expected to grow. A 36,000-square-foot expansion at Waterloo Container of Seneca Falls is underway and expected to be completed by the end of the year. Shown at the site are company President Bill Lutz (left) and Seneca County IDA Executive Director Bob Aronson. The supplier of wine bottles, caps, corks and closures began a 36,000-square-foot addition to the main office and warehouse at 2311 Route 414 in October. Bill Lutz, owner and president of Waterloo Container, said it should be completed by the end of the year. The new building will allow expansion and reconfiguration of the company’s massive glass bottle and packaging supply inventory. It will create a space for the addition of a second state-of-the-art pre-pack line, which moves bulk glass into convenient individual cases, and for continued growth of a high speed shrink sleeving applicator and tunnel. A total of 15 to 30 new jobs are expected to be created. In addition to the structural addition, the company has made upgrades to its network infrastructure. Those improvements will help customer service representatives access information more quickly and allow the company to get the bottles, caps and closure orders placed with greater accuracy. Wiring, switches and servers have been enhanced and added software programs will improve the way requests are handled and information flow in and out of the building are better managed. New security has been added to protect customer information as well as company information. “We have made a lot of great improvements and plan to keep up with technological advances as they present themselves,” said Information Technology manager Chris Plate. “The IDA is pleased to see this growth taking place. The additional jobs will be a great benefit to Seneca County’s economy,” said IDA Executive Director Bob Aronson. Waterloo Container is a family-owned and operated business started in 1980 by Norm and Bill Lutz to support the growing wine industry in the Finger Lakes Region and the East Coast. It offers an extensive selection of glass wine and spirit bottles manufactured in the United States. It also stocks many imported wine, spirit and specialty bottles. It offers a personalized packaging program that includes eight-color ultra-violet ink glass printing and high-speed shrink sleeving. The company also provides in-house repacking, quality select and warehousing for customers and has its own fleet of trucks and drivers. Put together a perfect pairing and enhance your seasonal sales with our tasteful and sturdy kraft 2pk Holiday Carrier. In Stock and ready to ship. Call any of our friendly customer service reps today to order! 888-539-3922. Waterloo, NY, October 9, 2018– Waterloo Container is pleased to announce an expansion project which includes a 36,000 square foot addition to the main office and warehouse location at 2311 Route 414. This project commenced earlier this fall and is expected to be completed by the end of this year. Footers and steel beams are being placed and over 400 cubic yards of cement has been poured as of Monday October 8. Waterloo Container supplies packaging materials including glass bottles, caps, closures to the wine, spirits and craft beverage industries throughout the United States and Canada. The new building will allow expansion and reconfiguration of Waterloo Container’s massive glass bottle and packaging supply inventory. This inventory movement will create space for the addition of a second state of the art re-pack line (which moves bulk glass into convenient individual cases) and for continued growth of a high speed shrink sleeving applicator and tunnel. “Waterloo Container is excited to be growing to meet the needs of our growing client base and looks forward to being able to offer additional jobs in the community and enhanced services to our customers” says CEO Rich Swinehart. In addition to the structural additions, there have been recent upgrades to network infrastructure. These improvements will help customer service representatives access information more quickly and allow us to get the bottles, caps and closure orders placed with even greater accuracy. Wiring, switches and servers have been enhanced and there are added software programs to improve the way we handle requests and manage information flow in and out of the building. New security solutions have been added to protect our customers’ information as well as our own. IT manager Chris Plate says “We have made a lot of great improvements and plan to keep up with technological advances as they present themselves”. Waterloo Container is adding to our in-stock shipping supplies with a new Pulp shipper! Available in both 3 and 12 pack sizes these ISTA rated shippers help you get your DTC and Wine Club shipments out the door and to your customers with guaranteed reliability. No waiting - and No MOQ's! Call us at 315-539-3922 or contactus@waterloocontainer.com to get yours today! GET JACKED UP FOR THIS GREAT OFFER! New Customers get a free pallet jack with your truckload glass order! Browse through our wide variety of quality bottles to see what’s best for you! Interested? Our friendly and dedicated customer service representatives are more than happy to help! Become a customer today because this offer is a jack of all trades! Satin Black PVC Capsules at an Incredible Price! We have a great selection of Domestic and Imported Wine bottles Caps and Closures! We now have a special offer for our newly added 30x60 Flat Black PVC Capsules! Includes a Gold Tear Tab and Embossed with a Grape Cluster and Leaf Graphic to add style! Act fast because these savings and capsules won’t last and they are ready to be shipped to YOU! ARE YOU READY TO CRUSH?!? We now have Rice Hulls available in stock paired with some great savings! Help make your grapes less slippery and less likely to shoot out through the slats during pressing by sprinkling these rice hulls over your crushed grapes! Offered at a variety of packaging size options, these rice hulls can be used for 2 to 6 tons of grapes! Call today to place an order or to reserve your bags! Special Transition Glass in Stock! We now have a very special transition glass in stock! Ready to move on from the traditional bottle colors? Looking for a unique bottle to jazz up your inventory? Then transition into purchasing some of our special transition glass. From cobalt blue to champagne green, transition creates beautiful and unique colors during the glass manufacturing process that would look great on your shelves! Act now and make your transition now because when this glass is gone, it's gone! Great offer on Flat Black PVC Capsules! With an easy-to-match color scheme and embossed with grape cluster and leaf and a tear tab, these capsules are the perfect match to compliment your favorite cork finished bottle. Act now before there gone! Four NEW special offers this week! Check out our Special Offers page on waterloocontainer.com where we offer closeouts, overstocks, sales and showcase new products. Our Specials are updated often so check back frequently! Visit Waterloo Container at Booth #1230 at the Craft Brewers Conference in Nashville May 1-3 to get in on some great show specials! See our newest craft beer bottles and get information on glass printing, sleeving and package customization options that we have in house for you! Waterloo Container will be at the Finger Lakes Craft Beverage Conference! Come See us at the Finger Lakes Craft Beverage Conference on March 27th at Del Lago Casino Resort. New Customers: Ask how you can get a FREE PALLET JACK with your full truckload order! Waterloo, NY, January 16, 2018– Michael Mattia has joined Waterloo Container as Vice President of Operations. Michael comes to Waterloo Container after a 25year career with Constellation Brands, most recently serving as their Director of Procurement. He brings experience in supplier management, new product development and a proven track record of success in the alcoholic beverage industry. Michael earned his BBA from Saint Bonaventure University. “We are excited to welcome Michael to our growing company. His vast experience and knowledge in the wine industry will be utilized to enhance our ability to source new products and packaging and to further develop relationships with our larger customer accounts.” – Bill Lutz, President and Owner Waterloo Container Company. 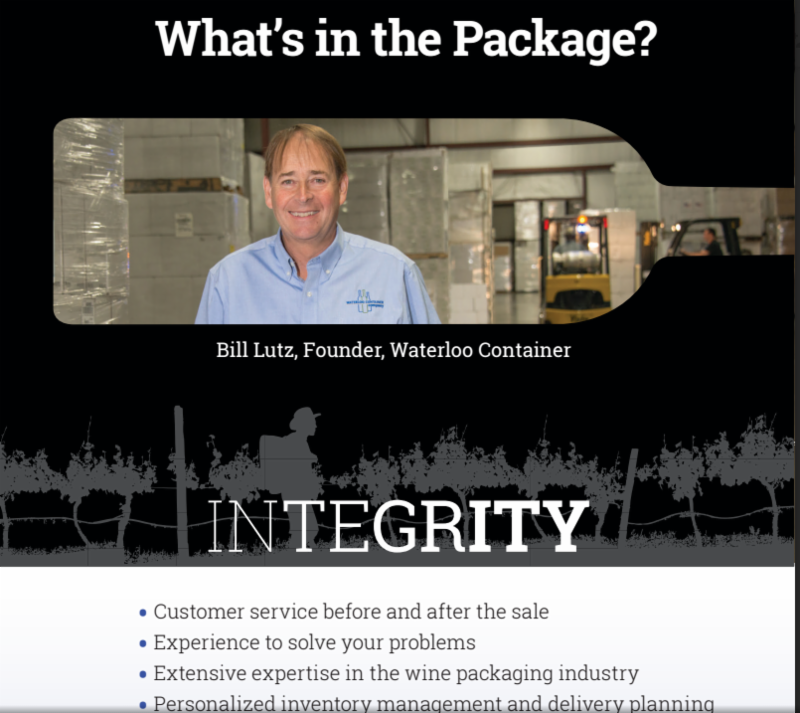 About Waterloo Container: Waterloo Container is a family-owned and operated business started in 1980 by Norm and Bill Lutz to support the burgeoning wine industry in the Finger Lakes of New York and on the East Coast. Today, we offer an extensive selection of glass wine and spirits bottles manufactured right here in the United States. We also stock and source many imported wine, spirit and specialty bottles. Our vendor partners have been extremely influential in our success and we are proud to work with the best in the industry for glass, corks and closures. We offer a personalized packaging program that includes services like eight color UV ink glass printing and high-speed shrink sleeving. We also provide in-house repacking, quality select and warehousing for our customers and employ our own fleet of trucks and skilled drivers. We take pride in being a reliable provider of the highest quality glass containers and packaging products available. We are proud to have been an integral part of the wine and craft beverage industry’s growth in Eastern North America. We look forward to continuing to grow together over the years to come. Get your sleeve on with Waterloo's new high speed automated shrink sleeve applicator! Sleeving offers 360 degree design capability and limitless color combinations - a decorators dream! Sleeving offers 360 degree design capability and limitless color combinations - a decorators dream! Check out the process here! Waterloo Container will be at the Craft Brewers Conference April 11-13 in Washington DC. Come see us at Booth 945 to check out our current beer glass offerings. Learn how easy it is to get UV printing on your next package with our state of the Art glass printing. Make your bottle stand out with up to 8 vibrant colors! See Waterloo at Upcoming Tradeshows! It is tradeshow season! Come see us and explore what's new at Waterloo Container! Eastern Wine Exposition in Syracuse, NY March 22-24 we will be in booth #512! Owners Bill & Annette Lutz recently attended the All 4 Pack Conference in Paris, France on November 14-17. They were there to meet with current packaging partners and learn more about innovative package options that have hit the European scene. The conference, held at Paris" Nord Villepinte Exhibition Center featured containers and packaging for all aspects of cosmetics, pharmeceuticals and of course the wine, spirits and beverage industries. Bill was impressed with the new Rose line featured by SGP by Verallia! Waterloo Container likes to promote hard working individuals from within and recently we have had another in house promotion we would like to share with you. Patrick O'Brien demonstrated a great work ethic and attention to detail while working in our small package mail room, and was recently rewarded with the opportunity to move up to our Customer Service Team. 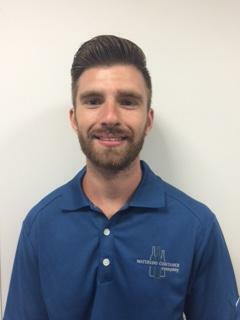 He officially takes the new full-time position on August 1st after spending the last month intermittently training with the sales and customer service team to learn his new role. He has proven to be a fast learner and his attention to detail is evident already in his new position. When Patrick is not moving up the ladder at Waterloo Container you can find him working at his other job, landscaping. He is recently engaged and is saving up for a planned October 2017 wedding. When he does have a free moment he grabs a fishing pole and heads outdoors! Waterloo Container advertises in several of the popular industry magazines including Wines and Vines, Wine Business Monthly, Vineyard and Winery Management and Wine & Craft Beverage News. We recently changed direction with our ad campaigns, bringing the message back to our values and featuring our Founder and President Bill Lutz. Learn more about the history of Waterloo Container and how Bill created this successful business by checking out our "About Us" and "History" sections on our Website. Sales Territories Re-Aligned to Better Serve You! Waterloo Container would like to welcome George Hall to our sales force in the position of Territory Sales Manager. George will be serving customers in the Finger Lakes and Northeast Pennsylvania. 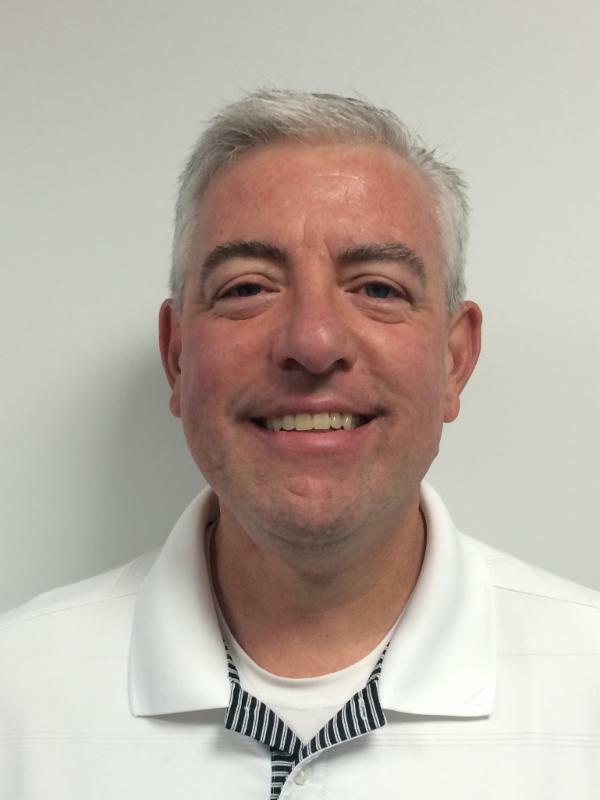 He brings more than 25 years of customer focused sales experience to our team. George is sure to be a valuable assett, having moved to us after a successful career in Corporate Employee Benefits where he helped Trusted Advisors build their businesses throughout New York State.George plans to achieve the same success here, using his collaborative style to help you grow your business profitability while developing trusting partnerships. When George is not helping you with your bottle, cork and closure needs, he can be found enjoying the company of his wife Debbie and 3 college age children.Along with visiting local wineries, distilleries and breweries, he enjoys vacationing with his family and taking advantage of the area's abundant lakes. Waterloo Container is proud to introduce our new website. Same web address... all new look! More inclusive information on our products and services! Our new site offers access to our one stop package shop and can help you brand your package and create a look deserving of your hard work. Browse our extensive product selection which includes everything from glass wine, beer and spirits bottles to closures & boxes. Check out our web pages to see all of our service offerings from inventory management to colorful custom glass printing to delivery services! Download a catalog of your favorites with a helpful forecast worksheet to organize your shopping experience. Find everything you need to start your project today, and with our fast-from-stock availability many of our most popular products are ready for immediate shipment to you! 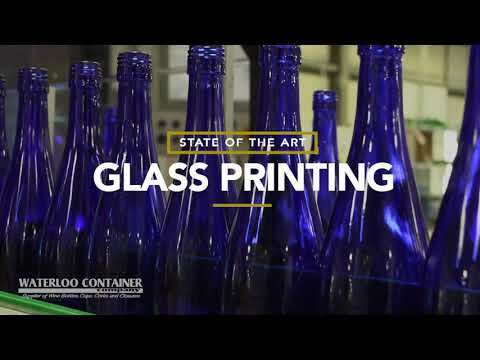 Waterloo Container is proud to offer state-of-the-art printed glass service. We use Servo technology which is much faster and more accurate than manual methods. This single-pass UV inking process provides registration accuracy, durability and quality. Eight color printing helps you stand out from the competition. We currently offer bottle printing on our most popular beer, wine and champagne bottles with a turnaround time of only 10 days (after art proof approval). At the 16th annual Finger Lakes International Wine Competition, wines from around the world are judged on their aroma, taste and finish. A new award judges another component of the wine: the package it comes in. 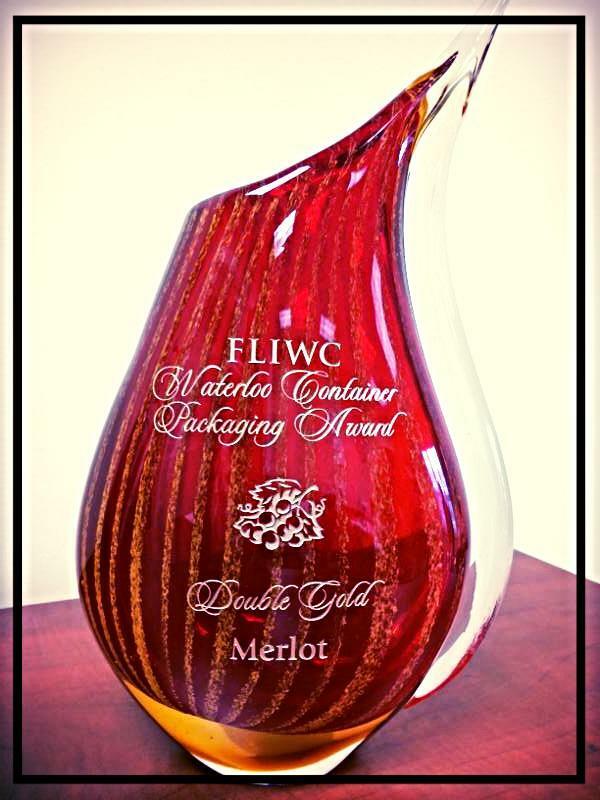 Created by Waterloo Container in 2015, the Packaging Award recognizes excellence in packaging among the competition’s top wines in 8 categories. Wines are evaluated on their innovation and package design, including container, label, closure and shelf impact. The award was given to two wineries in seven of the competition categories: Merlot, Riesling, Cabernet, Ice Wine, Cab Franc, Fruit Wine and Chardonnay. To be eligible for the award, packaging must have been manufactured in the U.S. or Canada. A team of judges included marketing professionals, packaging manufacturers and Waterloo Container employees. The Finger Lakes International Wine Competition was held at the Rochester Plaza Hotel & Conference Center and is the world’s largest charitable wine competition, benefiting Camp Good Days. On March 19and 20 the competition hosted 73 judges from 23 countries around the world who evaluated 3,824 wines, with awards given in 8 categories. Sixty-six wine professionals from around the world stayed in the Finger Lakes after judging at the Finger Lakes International Wine Competition. They visited award-winning Finger Lakes wineries and attended a lunch at Waterloo Container in Waterloo, NY. The lunch and learn event featured three of the top beverage packaging manufacturers in the U.S. introducing new packaging innovations. These are innovations that you can expect to see on the shelves next to your wines – or maybe holding your wines – in the very near future. Speakers at the luncheon included Ted Ramsey, Amcor Stelvin; Walter Schaefer, Ardagh and Wes Ward, Nomacorc. Waterloo’s new training facility made its debut during the education session, which covered screw top closures, new wine bottles and a zero-carbon footprint cork made from sugar cane. Stelvin® is introducing a wine screw cap closure called the Stelvin® P for sparkling beverages. The new closure withstands up to 6 bars of internal pressure, effectively protecting carbonated beverages while controlling the OTR levels in the bottle. Waterloo Container has designed a champagne-type bottle to coordinate with the Stelvin® P for sparkling wines. The pressurized bottle is designed for sparkling wines, hard ciders and other lightly carbonated products. These products are often limited to high-end bottles with high pressurization, even though they only give out a low pressure. The bottle holds up to 3 volumes of carbonation with a reinforced heel plate and walls. Modest carbonation equates to a modest price with this bottle – you don’t have to pay large prices for just a little carbonation. 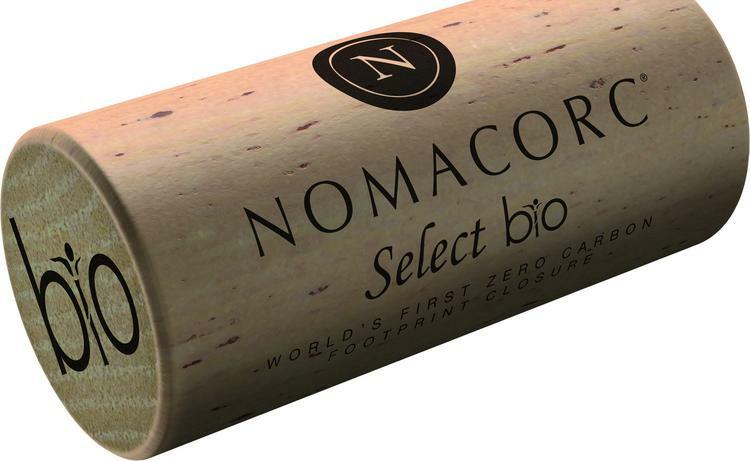 The Select® Bio cork from Nomacorc is the first zero-carbon footprint cork. Made from sugar cane, the cork is recyclable, sensory neutral and made in factories that run on solar and wind power. This new cork also allows for a high level of oxygen control. Ardagh is introducing two new types of bottles and a new manufacturing process. 3D printed bottles are made at their headquarters in Muncie, Indiana. Using this new, up-and-coming technology allows them to print a bottle in 24 hours. This innovation is more than “cool” – it’s also cost-effective over Lucite bottles. New bottles include a hexagonal-shaped stackable bottle, which makes for an interesting shelf display and bottles with a pour spout finish to eliminate drip. On March 21and 22 the 15th annual Finger Lakes International Wine Competition hosted 72 judges from around the world who evaluated 3,700 wines. New this year is a Packaging Award category created by Waterloo Container. The packaging supply distributer sponsored the event for the first time in 2015 as part of their ever-growing presence in the Finger Lakes Region. Held at the Rochester Plaza Hotel & Conference Center, the Finger Lakes International Wine Competition is theworld’s largest charitable wine competition, benefiting Camp Good Days. Waterloo Container is the largest distributor of packaging supplies to the wine industry on the East Coast. Waterloo decided to become a sponsor of the competition as many of their customers are located in the Finger Lakes and participate in the competition each year. The new Packaging Award was judged at the end of the day on Sunday, March 22. To be eligible for the award, packaging must have been manufactured in the U.S. or Canada. Executive Vice President of Sales & Marketing Togo DeBellis, of Waterloo Container, assembled a team of judges that included marketing professionals, packaging manufacturers and Waterloo Container employees. Judging was based on innovation and package design, including container, label, closure and shelf impact. The award was given to two wineries in seven of the competition categories: Merlot, Riesling, Cabernet, Ice Wine, Cab Franc, Fruit Wine and Chardonnay. On March 23, following the competition, 66 judges from around the world stayed to visit award-winning Finger Lakes wineries. Waterloo Container hosted the judges over a lunch stop. The lunch and learn event featured three of the top beverage packaging manufacturers in the U.S. speaking on new packaging innovations. Lunch also included a tour of Waterloo Container's warehouse and automated repack line. Ted Ramsey, Amcor Stelvin, presented on oxidation and success rates of screw top closures, including a new screw top closure for sparkling wines. Walter Schaefer, Ardagh, showed prototypes of new wine bottles including bottles with pour spout finishes, hex-shaped stackable bottles and the emerging technology of 3D printed glass bottles. Wes Ward, Nomacorc, spoke on their newest product. Select® Bio cork, the first zero-carbon footprint cork is made from sugar cane. Located in Waterloo, NY, Waterloo Container has been family-owned and operated since 1980. It is the east coast’s largest stocking distributor of packaging supplies to the wine industry. Waterloo is committed to stocking only the best brands in their 250,000 square feet of warehouses. Their unique services include stocking bottles, corks, capsules, wax, boxes and other packaging materials used in the wine and craft beverage industry. Inventory is constantly updated according to customer feedback and emerging trends and innovations. For more information, visit www.waterloocontainer.com. Waterloo Container is nearing completion on a new building. The facility houses inbound and outbound sales for the company as well as a new training space. Training will be provided to Waterloo customers through the facility. The company wants the wine community to know how imperative these trainings and education within their industry can be. To start, Waterloo plans on bringing in specialists who can train customers in everything from enclosures to glass to labeling and packaging. With nearly 4500 customers relying on Waterloo Container, the company has long been interested in investing in the development of the industry. Part of their new building is a large conference room for trainings. The room will be equipped with the latest technology including flat screen TVs to aid in presentations. Congressman Tom Reed recently visited Waterloo Container to tour the new facility. While on his tour, the Congressman saw the company’s Seneca County warehouses, which cover about 250,000 square feet and house the many supplies that are the lifeblood of the New York State wine industry. The wine industry is one of largest tourism draws that New York State has to offer. With more than 100 wineries, the Finger Lakes wine region alone is the largest wine producing region in the country – east of California. Adding that to wine produced throughout the state, it is easy to see how tourism dollars are dependent on the visitors this industry brings in. According to the New York Wine & Grape Foundation, “The New York grape, grape juice and wine industry generates more than $4.8 billion in economic benefits annually for New York State. 1,631 family vineyards... 373 wineries... 175,000,000 bottles of wine... $408 million in state and local taxes…” Our economy thrives from the several thousand people who are employed because of wine production. In its 34th year of serving the wine community, Waterloo Container is owned by Bill and Annette Lutz, who started the company in 1980. It remains one of the only family-owned and operated suppliers of the wine industry left in business. It is this history and deep ties to the local wine region that inspires the Lutzes and Waterloo Container to keep on giving back. Waterloo Container’s support of the wine industry in New York State is plentiful, as they continue to show year after year. This year, the container company worked toward opening the training facility to support the local wine industry in educational trainings, industry development, and events that continue to showcase the New York State wine industry and the Finger Lakes Wine Region. Wine education has always been a top priority for Waterloo Container. Over the years, they have invested in local symposiums, wine festivals, and programs that encourage the development of the region and help produce new products and varietals of wines. For example, Waterloo Container is a primary supporter of the “Wine Symposium of the Finger Lakes,” and the Winestock NY event – both held in Geneva, N.Y. each year. In 2013, the company gave a significant contribution to a grassroots program called NY Wine Spotting that aims to boost the number of New York wines on area restaurant lists. They also work alongside Cornell and its Cooperative Extension Program, investing in the college’s experimental station. This aids in the development of new grape vines, giving area winemakers new and fresh flavors to work with. The training facility will help the wine industry grow by educating area wine producers about all of the elements that go into putting a bottle of wine on the shelf. Waterloo Contianer is Expanding to Help Serve Our Customers! We here at Waterloo Container continue to strive to offer our customers the best service possible. We are growing to better manage the increasing demand for product, as the wine industry, local and all over the U.S. flourishes. Recently acquiring a neighboring 55,000 sq. ft. warehouse, allows for a larger "on-hand" supply. In conjunction with our increasing number of, efficient, friendly staff, we are working to keep our customers satisfied, in order to make it easier for them to get their product ready for all to enjoy! Give us a call at 888-539-3922 to learn more about how we keep our incredibly loyal customers satisfied. More Successful Trade Shows in 2013! After a great run at the EASTERN WINERY EXPOSITIONand the WINERIES UNLIMITEDShows we are back to working on bringing our customers the best value and quality products we can! The turnout was wonderful at the Customer Appreciation Parties Waterloo Containerhad the privilege of hosting. We do this in hopes of thanking our loyal customers while getting the chance to get to know some of the new faces we meet at the shows! It also gives us a chance to showcase some of our new items, such as the Selective Line by Saint-Gobain Emballage. Year after year we look forward to attending these Shows and will continue to do so in the future! Available in12oz, 22oz or 750ml crown, 750ml Belgium and even a 65oz Growler-they are ready for youto take by the bottle or by the truckload, what ever you need! We offera wide array of unique bottles for you to chose from- domestic and foriegn crafted! 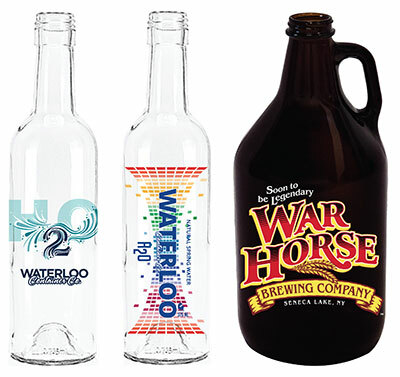 Let Waterloo Container apply and shrink your label directly onto your bottle. Get 360 degrees of custom design and shelf appeal! Make an ordinary bottle look extraordinary with shrink sleeving today! With your artwork and our 8 color custom glass printing technology, the design possibilities are virtually endless. Replace your paper labels with stunning UV cured ink graphics and stand out on the shelf!